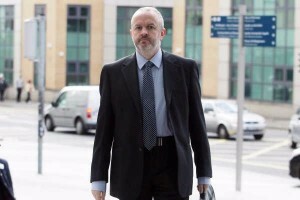 On day 71 of the trial at Dublin Circuit Criminal Court, Bernard Condon SC, defending, continued his cross-examination of Kevin O’Connell, a legal advisor with the Office of Director of Corporate Enforcement (ODCE) who dealt with witnesses from EY, Anglo’s auditors from 2002 to 2008. Mr O’Connell was answering questions about the ODCE’s process of drafting witness statements in consultation with witnesses and their lawyers. He agreed that during the first trial of Mr FitzPatrick in April 2015 “a bright light was shone” on this process and it was revealed to be “sub-optimal”. The witness said since then the ODCE changed their practice so that witnesses in criminal investigations were now only interviewed by gardaí. He said that this process of the ODCE engaging with witnesses and lawyers was alleviated by the extensive documentary recording, giving “an unusually detailed chronicle as to what was going on”. Mr Condon put it to the witness that this only went as far as where documents still existed and not where documents may have been shredded. Mr O’Connell then told the jury that he had in fact shredded what he said were “a tiny proportion of documents” at a later stage. “At a later stage I made a calamitous error. I shredded a small number of documents which I ought not to have shredded,” he said. He agreed that they were shredded just after he had been cross-examined by Mr Condon in April 2015. “It was a time of enormous pressure. I made a dreadful mistake which thereafter I acknowledged and admitted,” the witness said. He said the documents related to notes from conversations he had with A&L Goodbody, the lawyers for EY. Mr FitzPatrick’s defending barrister also put it to the witness that his client was in danger of being jailed because of a “clanger” of a mistake made by the bank’s auditors, EY. Counsel told the court that EY had asked Anglo directors to sign the “wrong” types of documents during some of the relevant years. Mr Condon said: “It looked like they (EY) used the wrong document. It looks like they made a mistake. Surely it crossed your mind, these people made a clanger?”. He asked the witness did it not occur to him that this mistake necessitated a “forensic examination” of the auditing process. “You’re trying to prosecute one man, put him in prison, on foot of what these people produced,” counsel said. Mr O’Connell said the the ODCE did not see itself in the role of investigating the auditors and said if it was the wrong document, “it still demanded a truthful answer”. The witness denied that the ODCE were “driven by a desire to produce a head” or that “in this case it was to be Mr FitzPatrick”. Mr Condon said: “You got carried away with yourself because you had in front of you the opportunity to get Sean FitzPatrick, in the context where your office was highly sensitive to the political sphere and public outrage and to who Mr FitzPatrick was”. Mr Condon suggested that Mr Appleby also “had a very significant desire to get Mr FitzPatrick”. “I can’t speak for Mr Appleby but I don’t believe he was motivated by improper motives either,” Mr O’Connell said. The jury heard that in October 2010, six months after the first meeting between ODCE and auditors EY regarding statements from EY witnesses, Mr Appleby wrote to EY to express concern over delays in furnishing the statements. Liam Kennedy, a partner with A&L Goodbody, contacted Mr O’Connell and said the letter was unfair. In a note of the conversation shown to the jury, Mr Kennedy said to the ODCE investigator: “Now basically do you want us to continue co-operating because EY wants to assist your enquiries. “I just wanted to mark your cards. The letter was inappropriate”. Mr Kennedy went on to say that EY were working with the investigators on voluntary basis and sending a letter of that sort was a major disincentive for them to continue doing so. A summary note from Mr O’Connell at the time stated: “He said that he was not threatening, but wanted to make it clear that they had been bending over backwards at their end”. Mr Condon described the row as “a lover’s tiff” and told the witness “you all got back together” afterwards. He said there was a three way relationship between the ODCE, EY and their lawyers, A&L Goodbody and that it was improper. He said the ODCE were dealing with people who had their own agendas and the ODCE were fearful of asking them hard questions. Mr O’Connell said that he felt that they did ask all the questions they felt were appropriate. “This was a compromised relationship,” Mr Condon submitted, saying that EY and their lawyers were dictating to the ODCE. Mr O’Connell denied this and said the ODCE were dependent on the voluntary co-operation of people who were not obliged to assist. Mr Condon put it Mr O’Connell that the auditors, Kieran Kelly and Vincent Bergin, had given sworn testimony that they would have given statements in the absence of their lawyers, if anyone from the investigation had asked them. Mr O’Connell said that in 2010 that was not his belief and that he found it hard to believe it now.